Benjamin Lim was interviewed twice before taking his own life. Benjamin Lim’s case has brought about much to be discussed. Arrested in school and interrogated before taking his own life, could there have been measures that could have prevented this young boy from jumping to his death? Being a teenager is a weird thing as it is, many of us were confused with these new range of emotions and feelings we had. Then again most of us went through that without much news worthy events happening. Benjamin was no different, he was a curious 14 year old boy that may or may not have let his curiosity get the better of him. Based on Benjamin’s police statement recorded on Jan 26, the minor initially did not admit to touching the girl as he was “scared”. He confessed sometime around 12.15pm on Jan 26, after SIO Fareed had given the boy 20 minutes alone to “think again”. SIO Fareed said he had paused the interview as he felt that Benjamin was not being truthful. In response to questioning by counsel for Benajmin’s family Choo Zheng Xi, SIO Fareed clarified that he did not tell Benjamin that he thought the schoolboy was not telling the truth. “I told him that the purpose of investigation is to find out the truth, and I told him I will let him think and interview him again,” he said. 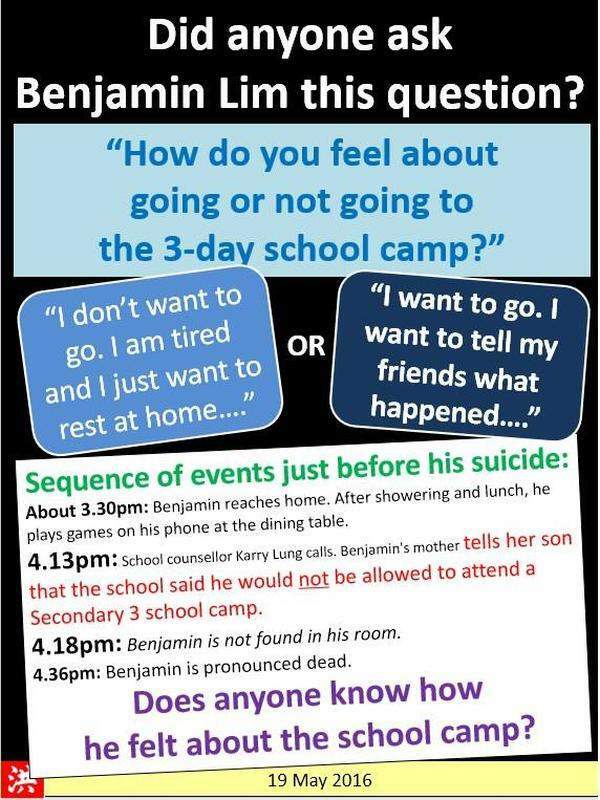 Before his eventual confession, Benjamin had been questioned by Inspector Poh Wee Teck at his school, and had been interviewed by SIO Fareed at the police station for about an hour. The court heard that Benjamin had also said in his statement that he was “sorry for what had happened” and that he knew what he did was “wrong”. He told police it was the first time he had touched a girl, and promised not to do it again. SIO Fareed read out a transcript of some questions he had asked the boy, including whether Benjamin had felt sexually aroused when he touched the 11-year-old girl. “Yes”, Benjamin had answered. But the boy denied he had touched the girl’s buttock. He told SIO Fareed he only touched the back of her left thigh. It has been argued that the boy would have been able to give a better state and view of the events that transpired if he wasn’t alone in the room. It has also been argued that then he would or could be influenced by another party to deny or validate the accusations. His case has been a tough one in regards to a minor. Teenagers are children after all and they lack the proper understanding of how the world works. Being arrested in front of his friends in school and taken away in a police car to a police station, to having your mom informed by the police about what you’ve done. The pressure alone would be enough to crush the spirits of any growing adolescent. What I strongly disagree with is some news sites saying that it was the refusal to be allowed to attend a school camp that pulled the trigger. The refusal would most likely looked to Benjamin like an affirmation of how his school saw him at that point of time. However, it most likely was nothing more an SOP for schools to suspend students who are currently assisting with or in the midst of a police investigation. It seemed that Benjamin could have used a lot more clearer explanations when being dealt with. Placing myself in his shoes as a 14 year old boy, I too would think that my entire future has died. Without anyone to explain anything I would believe that judgement has already been passed and furthermore I would believe that no matter what I say or do, nobody would believe the words of a 14 year old child. It is my hope that the case of Benjamin Lim would establish a proper modes of communication for young offenders, and the availability of counsellors to debrief and assess all juveniles and minors be they victims or suspects. » Why Can’t We Strike in Singapore?